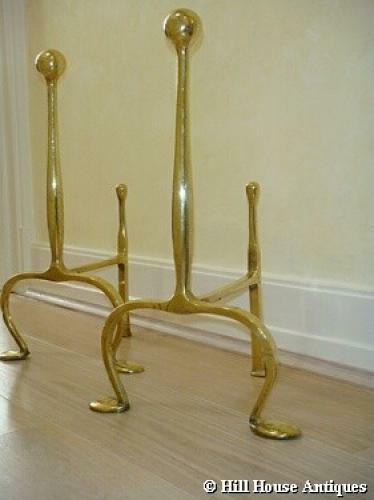 An extremely rare, elegant and imposing pair of large brass firedogs designed by CFA Voysey and manufactured by Thomas Elsley Ltd, Portland Metalworks, London c1898. These were available in two sizes at the time, these being the larger set at approx 18" tall. A smaller pair in wrought iron is in the collection of the Museum of Modern Art (MOMA) in New York.